A new Maine company has built a specialized canoe for mobility challenged veterans in the tradition of Down East custom boat building. This unique canoe will greatly enable Maine's outdoor therapy veteran non profits to increase access to Maine's healing woods and waters. 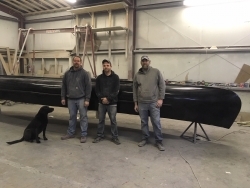 Steuben, ME, March 27, 2019 --(PR.com)-- Dirigo Custom Boat Works has built the Big Jack 24 foot Grand Laker style canoe for the purpose of safely transporting injured veterans on Maine's waters as they participate in outdoor adaptive fly fishing programs. “It was very clear to me that they understood the importance of this canoe to our veterans’ community. We have seen a welcome surge of outdoor recreation in Maine with great non-profits bringing our injured veterans here from all over the country to recover. Mosher’s company (Gold Star Outfitters, Inc) provides pro bono guide and outfitting services for veteran support non-profits such as the Travis Mills Foundation Veterans Retreat, House in the Woods and Project Healing Waters Fly Fishing. “This canoe will truly enable our guides to bring veterans and their families into the healing sanctuaries of Maine’s abundant lakes and rivers. It is clear to me that our state’s rich history of Down East custom boat building is alive and well at Dirigo Custom Boatworks and I am so thankful for the crew’s work in building Big Jack with such care and professionalism,” Mosher concluded. The Big Jack dedication ceremony and christening is scheduled for 12:00 PM on March 30, 2019 at the 2019 Maine Sportsman Show, Augusta Civic Center. All veterans and their families are invited to attend with special emphasis on Vietnam Veterans as they celebrate their 50th service anniversary year of 1969. Click here to view the list of recent Press Releases from Gold Star Outfitters, Inc.